As YouFood grows, we learn more and more about what works and how we can help our users. Beyond eating healthy and making good food choices, we learn just how effective YouFood is at connecting communities. At its core, YouFood was built for people to learn from each other’s success. Perhaps the most powerful example of this is the health communities that have popped up all over YouFood. It started with the Eat The Food (ETF) tribe and spread to the passionate community of Trim Healthy Mama. YouFood became the home base for both of these groups to connect, share recipes, and get support. And it’s working. You get the personal support you need in a positive and welcoming environment. You have a way to stay on track and help others in your group stay on track. Naturally, we asked ourselves, are there other groups that would benefit from joining YouFood? Before we could answer, a new community began to find us. Whole30 – thirty days of very strict Paleo eating with powerful results. It’s a restart to your body, grounded in making good food choices – the kind of healthy choices YouFood is all about. 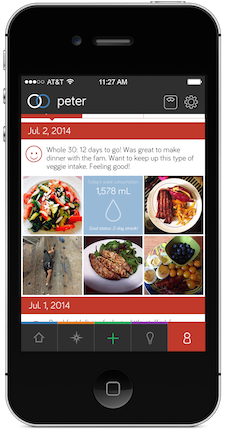 Hundreds of Whole30 users are already on the app. YouFood can be the place for the Whole30. Looking for a place to hold yourself accountable for your challenge? YouFood. Need meal ideas and recipes from other Whole30ers? YouFood. Searching for real life support from current challengers and others who have completed the challenge? YouFood. Whole30’s presence on YouFood made me curious about what this 30 day challenge was all about. And after reading It Starts with Food, I am Whole30’s number one fan. So, I began prepping for a Whole30 through the app. I engaged with Whole30 users, received powerful and motivating advice, and saw what 30 days of real Whole30 meals looked like. Once in flight, each meal I shared on YouFood held me accountable and allowed me to reflect on any changes I needed to make. Sure, I work for YouFood, but I believe in the Whole30. I want YouFood to be a community for you to get support from and give it back to other Whole30 users. So if you are interested in taking your Whole30 to a growing, vibrant community of supporters, download YouFood. If you want to see more about the Whole30 on YouFood check us out. Great post, Stephanie! I love using Two Grand to document my Whole journey, and I love seeing others post, too! Thanks Leslie! Glad you love it. What is your username on TG? Love the app and I will check out the challengers . Thanks Jodie! See you on the app. We currently only have the app for Android and IOS. You can download on the Apple App Store or the Google Play store. What is your username? We would love to connect with you!